I am the Asst Head Coach and Defensive Coordinator for Falcons, a KYA Sophomore (9U) Tackle Football team. We are off to one of the best seasons I’ve had coaching youth football at 3-0. We have most of our backfield from our Spring Super Bowl team and made some outstanding additions to our team in the Fall 2011 draft. At KYA you can only freeze up to 6 players from season to season. We froze four and drafted 12 new players to our team. We are 3-0. We are averaging close to 200 yards per game and 35 points. We are running a Pro I formation with a little Beast thrown in for good measure. Our defense has not allowed positive yardage. In three games total offense from opposing teams is a negative 59 yards. Yes -59 total off yards. We are running a hybrid 6-2, with many adjustments. Our special teams is also doing very well with 2 on-side kick recoveries in 3 games. I hope your season is going great. Play for Fun and Winning is Funner! I would like some advice. 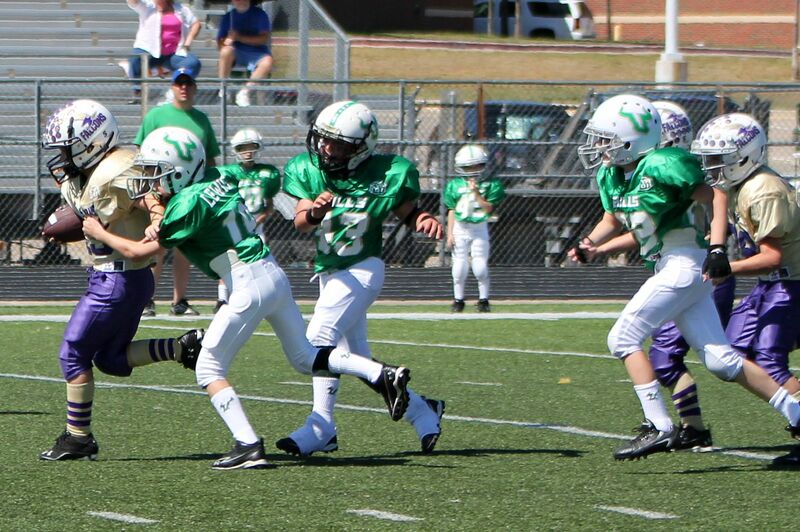 My sons play on same team little league football for 3rd and 4th graders. There are 29 kids on the team. Their coaches are playing ironman football with 5 or so kids including thier own while some kids are mabe playing 3-4 plays per game. Am i correct in my thinking that this is rediculous? The big issue you have with your team is that there are 29 on the team. most leagues are cutting down teams to less than 22 maybe around 17 or 18 players. This way more players get to play in games. If your team is a Select team then I can understand him playing the best players all the time. If your league / team is a rec league most leagues have 15 play rules which require coaches to play players for at least 15 plays a game. Remember, there is more practice time than the 60 minutes of game time. Make sure your players is getting the reps in practice and showing off their skills so they get game time. Practice is more important than the game to new players.